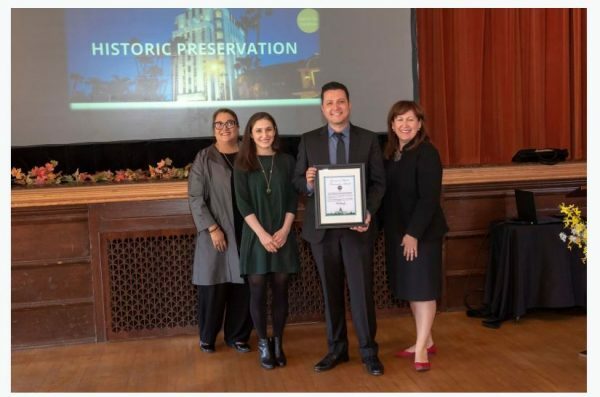 West Hollywood’s Planning and Development Services Department received the governor’s Historic Preservation Award for the city’s commercial historic resources survey, context statement, and preservation website at a ceremony in Sacramento last week. This award is the only official preservation award presented by the State of California in recognition of exceptional achievements in the field of historic preservation. The California State Office of Historic Preservation (OHP) recognized six projects that best reflected the broad scope of preservation endeavors taking place in California, from restoring historic structures, to innovative uses of surveys and technology, to preserving treasured cultural landscapes, traditions, and histories. OHP is responsible for administering federally and state mandated historic preservation programs to further the identification, evaluation, registration and protection of California’s irreplaceable archaeological and historical resources under the direction of the State Historic Preservation Officer (SHPO), a gubernatorial appointee, and the State Historical Resources Commission. Unfortunately the most historic building in the city’s downtown city center/westside remains wrecked looking like white mold disease crawling all over it – the “Revolver” builder northwest corner Santa Monica Boulevard/Larrabee. Will the city and “historic preservation” ever do something about this prime building at the city’s center?